I was surprised to see this notice. 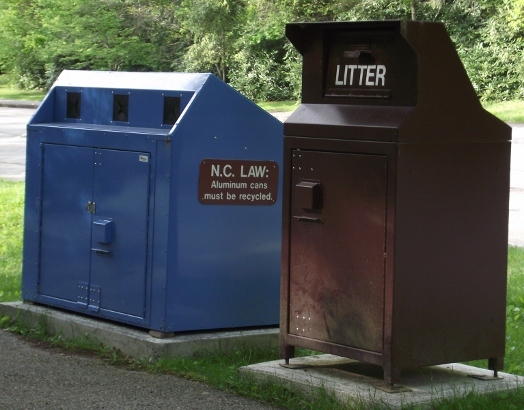 The sign on the side of the bin says that North Carolina requires that all aluminum cans be recycled. This wasn't the law when we lived there but I'm glad to see it. Recycling is important. Traveling is one of my passions. It saddens me to think that glaciers and trees are disappearing and that animal and fish species are being threatened. The problem seems to be that water supplies are dwindling. Apparently the animals get real grumpy when that happens.That problem can impact travel to many different destinations. If the NC law that requires all aluminum cans be recycled helps people go green then I'm all for it. Granted, I am not a rabid environmentalist. Rather I'm just a person who likes to travel and hopes her grandkids will be able to do the same. I believe that we can all recycle a few things. Aluminum cans, cardboard boxes, reusing or donating old clothing are all pretty simple things to recycle. Even if you don't believe that the earth is changing you can still recycle. After all, why just throw something away that someone else can use? Or (as in the case of aluminum cans) why not make a few bucks for yourself or charity in the process? I think it's pretty bold that NC requires all aluminum cans be recycled. It's certainly a step in the right direction.